Behind every great business, there is a story. The Corner House Bistro is no different. A vacation, a chance meeting and a happily every after paired with a passion for food and service. Alan and Vee invite you to learn a little more about them and look forward to meeting you. Vincenza, also known as Vee, grew up in your typical Italian home, Alan has spent his life in a kitchen perfecting his craft. Together they have brought Georgina a beautiful location focused on quality fine dining and exceptional service. Every single person dreams of meeting that special someone who will become an integral part of their life. While away on vacation, for Vee and Alan, this was reality. A vacation in 2009 turned into wedding bells in 2011, and they haven’t looked back since. As part of their honeymoon in Tuscany, they took culinary classes as a couple and perfected some classic Italian dishes. Their shared passion for food and cooking grew a dream of owning and operating their own restaurant together since very early on, and in September of 2016 their dreams were realized as they took ownership of The Corner House. A month of extensive renovations, meticulously planning every detail from decor to menu, they opened November 3rd, 2016 and have taken dining in Georgina to a new level. They are thrilled with the location close to the lake and are enamored with the small-town community they have chosen to live and grow in. Alan and Vee have both always viewed cooking as a way to bring family and friends together. You will feel this once you step foot in the door with a big welcoming smile from Vee, and Alan’s creations placed on your table in front of you. They are both community-minded and are happy to find HOME in Georgina, both from a business and personal standpoint and look forward to growing their business and their lives within this tight-knit community. Please drop in and join them for a meal at your leisure. Vee, grew up in her Italian home cooking, loving food and dreamed of owning a restaurant long before Alan came into her life. With an in-depth background in management as a successful entrepreneur in years past, Vee brings a wealth of knowledge to their new establishment. Enjoying interacting with the local patrons who join them each and every night, The Corner House has fulfilled her desires for a challenging and enriched new career path with the love of her life. 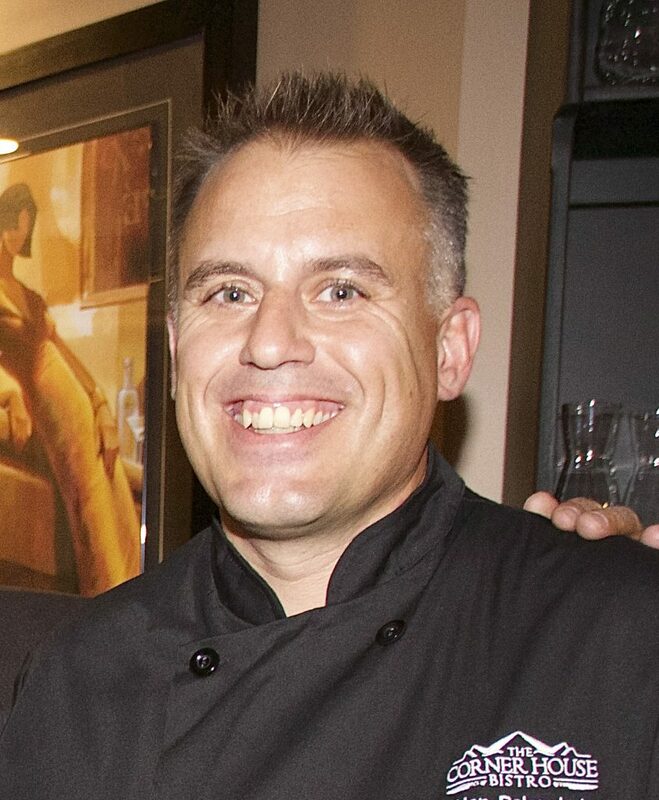 Alan, originally from Saskatoon, SK, has been cooking professionally since the age of 18. At that young age, he flew through a three-year apprenticeship under top chefs at a few different large hotels including The Sheraton Cavalier, graduating with top marks. He continued refining his skills, taking a Sous Chef position at a fine dining establishment in Saskatoon, called Jameson Street Restaurant, and then his first Head Chef position at Armadillos. The next step in his illustrious career was as Executive Chef and Partner for Mano’s, where he called home for over a decade. It was at this time the couple met, and there was a subsequent move to Ontario. After two years as the Chef at Nature’s Emporium, Alan did some consulting for various restaurants in Georgina while they focused on the perfect opportunity and location for them to bring their passion of owning their own restaurant to life. A wide variety of medals he has won through a number of culinary competitions, and an avid supporter of community through charity work, both which are the last things he speaks about. So happy we found this restaurant. Entertained some friends to celebrate the coming holidays. From the cocktails to the wine...the staff helped us make decisions that were perfect accents to our meals. The grilled calamari, feitto misto, and our main courses were creative and tasty Even though we were satisfied and full, we had to try their homemade desserts. We had a homemade cheesecake and creme brulee. Incredible!!! The owner "Vee" was so welcoming and informative, and even though the restaurant was busy, we felt like we were #1. This Chefs menu is worth coming back for.